Where does the power come from to charge the capacitor? Our goal is to have an adjustable 0 - 200 vdc power supply for voltage sweep testing. This page describes a simple variable supply; a subsequent page will describe a smaller fixed voltage supply that is more suitable for demonstrations. What are some options for an adjustable source of high voltage? A commercial high voltage test supply, such as from Hewlett-Packard, is available on the surplus market for $250 - $500 USD. These are older devices, typically designed to provide HV for vacuum tube circuits. They are quite large (a few feet on each side) and heavy (50 to 100 pounds) and low current (500 mA). Commercial units are too expensive and bulky for this project. Since voltage regulation is not needed, a very simple HV power supply can be built from a transformer and diode bridge. For adjustability, use a variable-tapped transformer such as a Variac. The output voltage can be smoothly adjusted from 0 – 132 vac, using the standard 120 vac line source. This schematic shows how the Variac might be connected. 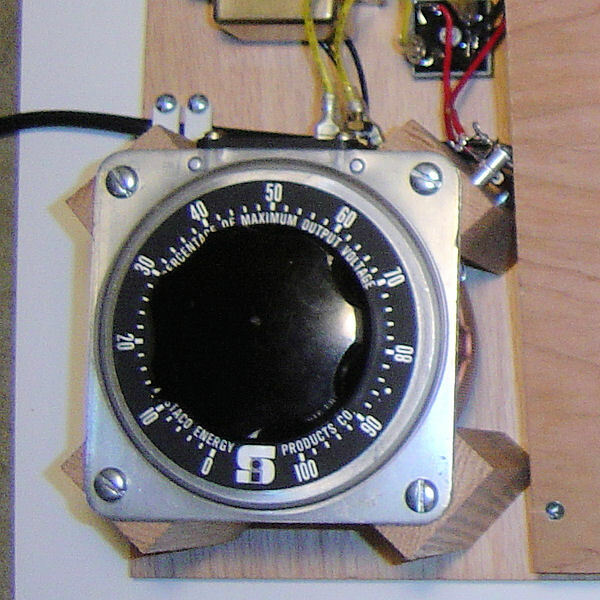 This stage of coilgun development used a General Radio Variac rated for 0 – 132 vac at 6A, as shown in the photo below. Note the Variac does not provide line isolation! Do not connect grounded equipment or an oscilloscope anywhere to the coilgun. The probe “ground” will carry a large current to the AC line socket. You must use a reliable GFI (ground fault interrupt) power outlet. Also notice the spade lugs on the back of the Variac. These were later found to be problematic, since they can be accidentally disconnected. The spade lugs were later replaced with soldered connections. Next time, I will begin with soldered connections and save myself some trouble.